I saw this gorgeous, earthy, local wool at my LYS. 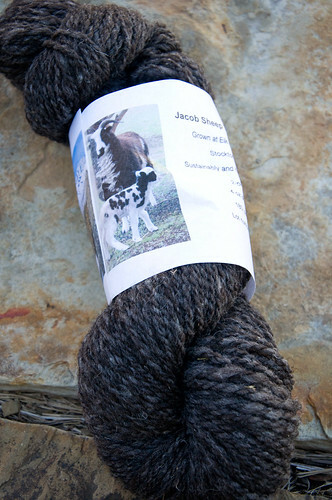 These Jacob sheep spend their time in Stockton, Utah (about 40 miles from Salt Lake City). 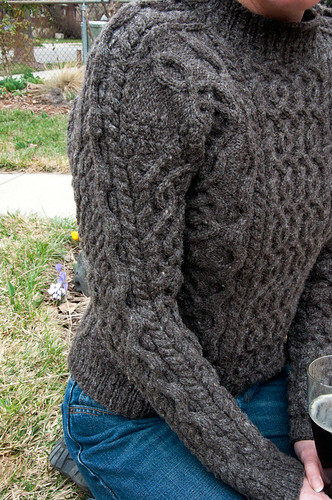 As soon as I saw the yarn, I knew it needed to be my next aran sweater and I started looking for a pattern. I ended up choosing St Patrick from Lisa Lloyd’s A Fine Fleece. The smallest size, however was 40″ and although my other aran is that size, I wanted something with a shade less ease so that I could wear it more easily under coats. 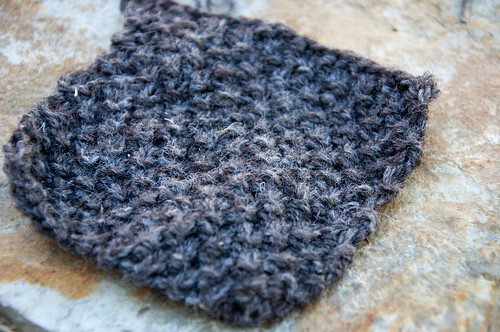 I removed some of the box stitch pattern on the sides, oh and then I worked it in the round instead of flat and used the saddle-shoulder join techniques from Beth Brown-Reinsel’s Knitting Ganseys book. There were more than a few moments where I worried it would be too small, or just weird. Am Ende, wählte ich St Patrick von Lisa Lloyd’s A Fine Fleece. Aber ich wollte ihn ein bißchen enger machen da mein Celtic Dreams Pulli etw. 100cm ist und ich hätte gern einen Pulli der einfacher unter Jacken zu tragen ist. Auch entschiede ich ihn in der Runde zu arbeiten und den Schultern sie in Beth Brown-Reinsels Knitting Ganseys zu bearbeiten. Häufig befürchtete ich, daß der zu eng, under einfach seltsam, wurde. The only odd things at the end are that there is a bit of striping in the yarn, depending how much of the white fleece was spun in in a particular section, and i should have probably modified the dropped shoulders of the pattern into more of a fitted sleeve. Die einzige seltsame Teilen sind Streifen, die abhängig von wie viel weisses Vlies in einem Teil des Garns zu finden war erschienen, und ich hätte wahrscheinlich die Schultern mehr als geformte Schultern gearbeitet. 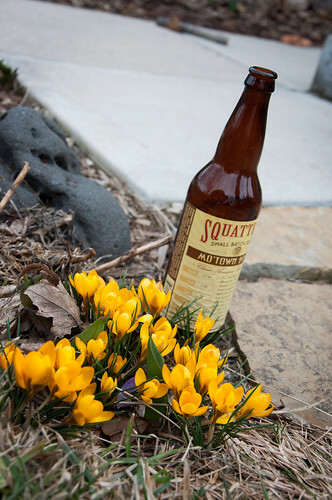 The beer is called Mo’Town Brown, and was brewed by a local craft brewery, Squatters. Mo’Town doesn’t refer to music here, it’s a reference to the local nickname for a Mormon, a “Mo”, which makes Salt Lake City “Mo’Town” (although anymore it would probably be more accurate to call Provo Mo’Town, as its population is much more LDS than SLC’s is, but SLC is still considered the capitol of the Mormon religion, so…). 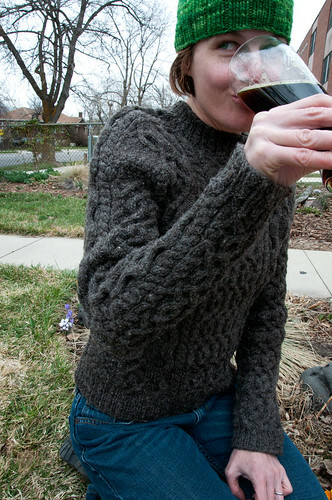 This entry was posted on Wednesday, March 30th, 2011 at 10:07	and is filed under a beer for every sweater, knitting. You can follow any responses to this entry through the RSS 2.0 feed. You can leave a response, or trackback from your own site. Oohh, great sweater! The cabling is insane and the fit looks spot on. I’m so envious about the locally produced yarn. Mo’town beer AND yarn! Thanks! It’s been a great sweater!